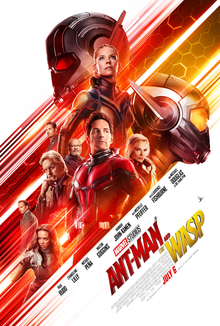 At the end of the Ant-Man movie, Scott Lang (Paul Rudd) as Ant-Man succeeded in shrinking down to the quantum realm and returning, which the inventor of the shrinking suit Hank Pym (Michael Douglas) had thought impossible. Pym had spent decades trying, because his wife Janet (Michelle Pfeiffer) had shrunk down into the quantum realm thirty years ago and he had thought her lost until Scott succeeded. For the last two years while Scott was on house arrest, Pym and his daughter Hope Van Dyne (Evangeline Lilly) have been researching this further, and they have invented a quantum tunnel that will let a person go to the quantum realm and back again. The moment they open the tunnel for the first time Scott has a dream about Janet Van Dyne, and they see that as a sign that Scott has a connection with her from his trip into the quantum realm. But before they can take advantage of that connection, a phase-shifting person in a mask steals Pym’s laboratory that has been shrunken to the size of a roller suitcase and disappears. Hope dons her mother’s Wasp costume for the first time and joins Scott as Ant-Man in the fight. This movie is, in the spirit of the first movie, a comedy as much as an action superhero movie. I loved getting to see the Wasp, I felt like Hope’s character was underutilized in Ant-Man. Paul Rudd’s comedy delivery makes much of the movie, and makes a great counterpoint to the on-screen gravity that Douglas provides. It’s a great movie for kids , generally lighthearted and fun, and even when they’re facing up against bad guys the bad guys get arrested rather than dying. One thing that felt like an off-note to me was the after-credits scene, which was very dark in tone if not explicit enough in meaning to be really bothersome for children. Apparently it ties into another Marvel movie that I haven’t seen because it did not make much sense, and I felt like ending on that tone and without any explanation was a mistake for what was otherwise an enjoyable light movie.